Another month has passed in the VGC 2019 Sun Series. We've had 2 Regionals in North America and 1 Special Event in Latin America. 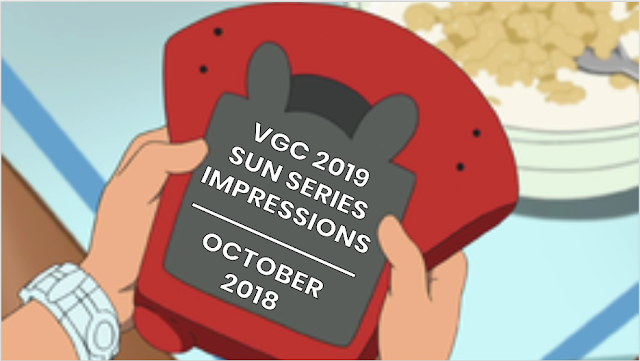 Some very interesting teams and developments in the format has come up, so let's look at what happened in the VGC 2019 Sun Series ahead of a very eventful November where the season's first International Championship in São Paulo, Brazil, the biggest event for the Sun Series. Last month, we talked about how Incineroar is the most popular Pokémon in this format in the format. Now, the combination of Kyogre + Xerneas has shown itself to be the Restricted Duo in this format that players should be preparing for the most as it won both the Frankfurt and Portland Regional using the same variant. The strength of it is being able to overpower your opponent thanks to Kyogre's rain-boosted Water moves and a Xerneas after it uses Geomancy. The most common variants have used Tornadus for priority Tailwind and can use Hurricane to threatens Grass-types like Ludicolo and Kartana with can use their STAB attacks to threaten your restricted Pokémon. Despite being almost nowhere very early in the format, Zygarde has started to see some usage at the Regional level. Wolfe Glick used it very early at Philadelphia Regionals to finish Top 32 but it didn't really catch on as to most players, Zygarde just isn't very good due to its lack of damage and weakness to Xerneas. The first player who used it to success was Justin Crubaugh who used Zygarde alongside Groudon to finish 7th at Memphis Regionals. Justin has been a large fan of Zygarde as he did win a Midseason Showdown with it shortly after. Recently, Terry Hong used Zygarde to finish 3rd at Portland Regionals on largely the same kind of team as Justin, which is a bulky team meant to support your Zygarde while having a Pokémon that can threaten other teams and cores. Most Zygarde will be trained to take hits so it can efficiently transition into its Complete form for the extra bulk while being able to set-up using moves like Dragon Dance and Coil to do so. Used by Matthew Greaves to finish Top 8 at Portland Regionals, Reshiram had a very interesting Pokémon that in his games on stream, Matthew showed how bulky of a Pokémon his Reshiram can be. Paired with Tapu Fini to activate its Misty Seed to take special hits better and thanks to his Groudon, Reshiram could use Solar Beam to threaten opposing Kyogre. Matthew proved that Reshiram does have a niche in this format and whether or not we see it in the future will be interesting. Tornadus has taken a very important and prominent role on the Kyogre/Xerneas teams. Tornadus was used to win both Portland and Frankfurt Regionals and was ranked #15 on VGCStats in October, earning roughly 3600 CP compared to the 382 CP it earned in September. Tornadus provides some crucial to these teams in priority Taunt to stop Roar and Trick Room and Tailwind for speed control, as well as a STAB Hurricane to threaten the Grass-types that Kyogre hates. Expect this to stay the same for the rest of the format. While not much of notoriety has happened in October, November does promise to bring major information. With the Latin American Internationals and Roanoke Regionals being the biggest events during November, you can expect that something will happen that shakes up the format, and it will be very interesting to see what happens.